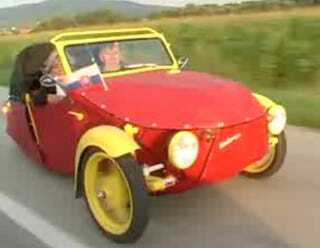 This is a Velorex, a cloth-bodied, three-wheeled car once produced in Czechoslovakia. It was originally powered by a small motorcycle engine. It is now powered by a small motorcycle engine that produces a crapload of power. Video? Naturally. There are a few problems here. First, the car is all kinds of hideous yellow and red, like somebody wallpapered a three-wheeled skateboard in Ronald McDonald's underpants. Second, the video is completely lacking in hoonage — there are no burnouts, slides, or stunts of any kind. And finally, the music, a cruise-line cover of Steppenwolf's "Born to be Wild," just makes me hate myself. Still, cloth car motorcycle engine cloth car motorcycle engine. Think of what you could do with this (and the many, many ways it could kill you). The possibilities boggle the mind. Ahh, Friday dreams.